The Janet L. Andersen Award for Undergraduate Research in Mathematical or Computational Biology was established by this special interest group in honor of our colleague and friend, Janet Andersen. Until her untimely death in November 2005, Janet Andersen was Professor of Mathematics at Hope College in Holland, Michigan. 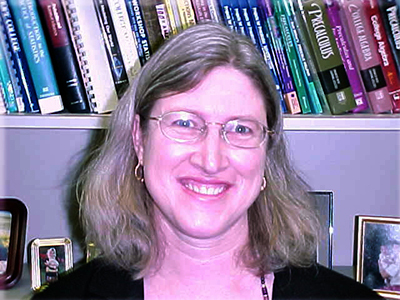 She joined the Hope faculty in 1991 after completing her master's and doctoral work in algebraic geometry at the University of Minnesota. 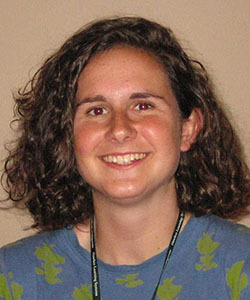 At Hope, she pioneered an interdisciplinary course in mathematical biology, was a research mentor for students in the field, and worked through several organizations such as the BioQuest Curriculum Consortium, the MAA, and the Society for Mathematical Biology, to broaden undergraduate exposure to mathematical biology. This prize honors her efforts. 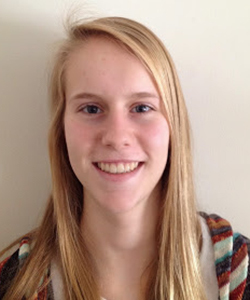 Allison Gerk grew up in Tinley Park, IL, and is a junior at St. Norbert College in De Pere, WI. 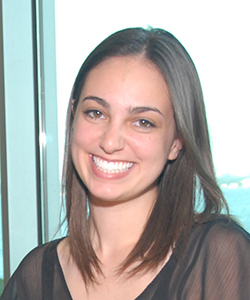 Allison began college with a major in Biology and a love of mathematics. She grew passionate for the application of mathematics in biology and medicine. She has since picked up a major in mathematics, and hopes to merge her two passions and apply them to her pursuit of a Ph.D. and career in research. She was thrilled to accept a summer research project with her mentor, Dr. Terry Jo Leiterman. Together they have been investigating the population dynamics of fish infected with columnaris disease. The research presented was built on modification to the Kermack-McKendrick SIR model of epidemics, where, in addition to the infected, the removed population affects the rate at which a susceptible fish becomes infected. Future steps will enhance the model by looking further into the transmission rate of the disease, vaccination and recovery of the fish, and in-house experimental data collection. 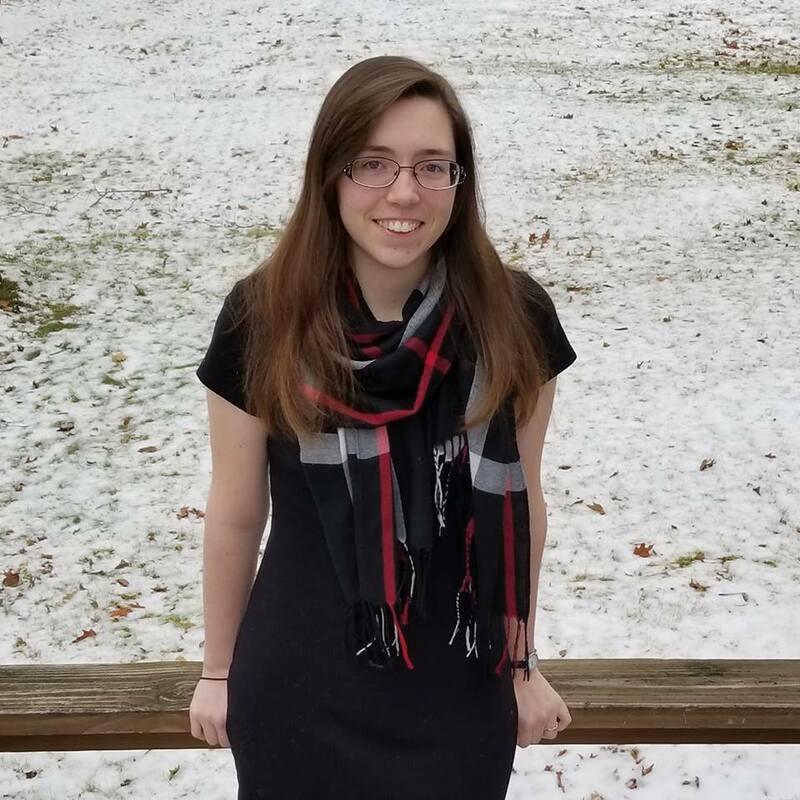 BethAnna Jones grew up in the small town of Worcester, New York and is currently a senior Applied Mathematics major at the State University of New York at Geneseo. Her interest in applied mathematics drew her to Michigan State University’s 2018 Summer Undergraduate Research in Experimental Mathematics program. Dr. Mark Reimers’ project in tracking neural activity specifically drew BethAnna’s attention for its programming aspects and biological application. After graduating, she plans to pursue a Ph.D in either Applied Mathematics or Computational Biology. BethAnna also enjoys flowers, cycling, bad puns, and riding rollercoasters. Amanda Stanley, who grew up in the small town of Marcellus, MI, is a senior Mathematics major at Grand Valley State University. She began working with Dr. Mark Reimer in coordination with Michigan State University's 2018 Summer Undergraduate Research Institute in Experimental Mathematics REU. 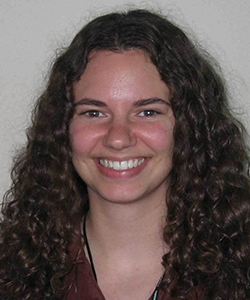 Amanda chose to be a part of the Tracking Neural Activity: Automated Image Analysis team to eplore applied mathematics. 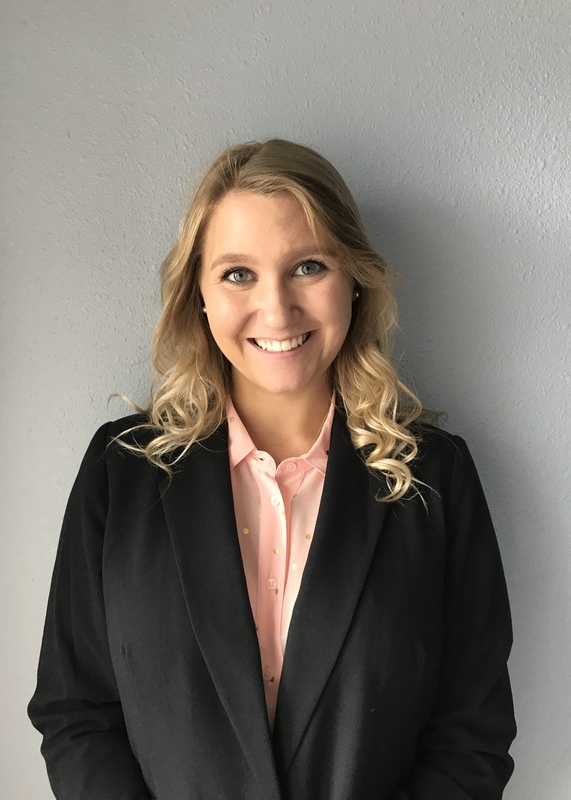 Outside of school, Amanda enjoys actively participating as President of the National Honor Fraternity Phi Sigma Pi and working as a math tutor. 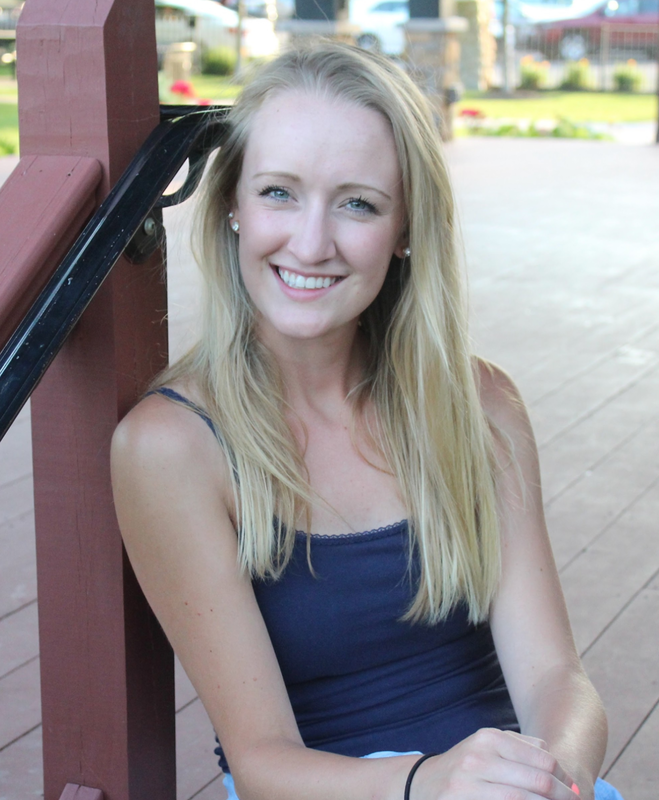 After graduating from Grand Valley, Amanda plans to attend graduate school for applied mathematics or a related field. Currently a senior at Hope College, Russell grew up on a small farm on the east side of Michigan. In his spare time, he enjoys reading, running, and watching movies. He originally decided to attend Hope College in order to study education, but his desire for a deeper understanding of the material and the opportunity to perform research soon changed his mind. Instead, he decided to double major in Mathematics and Psychology. Russell had already begun research with the psychology department when his advisor suggested working in the Math department over the summer, leading him to this project. With his research partner and mentors, Russell began exploring the application of mathematics to audio analysis, focusing primarily on the creation and implementation of a neural network that would "teach" itself to identify birds from their birdsong. Following his graduation, Russell hopes to apply to graduate school to pursue a degree in Mathematics with the hopes of one day working in academia. 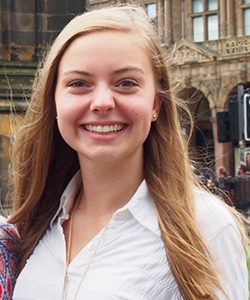 From Columbia, South Carolina, Mary Lib is a senior at Furman University, studying mathematics and information technology. During the summer of 2017, under the guidance of Drs. Liz Bouzarth and Kevin Hutson, Mary Lib and her research partner Zack built a computational model of pulmonary cilia patches to explore fluid motion and particle transport generated by ciliary metachronal waves. 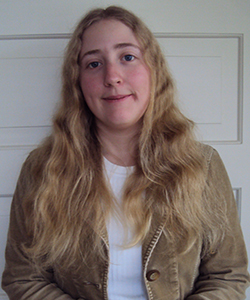 The field of computational science immediately appealed to Mary Lib when considering summer research opportunities due to her interests in math and computer science as well as their real-life applications. She hopes to continue to stay involved with research regarding mucociliary transport in the future. After graduation from Furman, Mary Lib plans to pursue a graduate degree in applied mathematics or a related field. Zack Miller was born and raised in Rock Hill, South Carolina and is a member of the class of 2018 at Furman University in Greenville, SC. Zack is pursuing degrees in applied mathematics and physics. Zack became involved with this summer research project, investigating cilia-driven fluid flows in the lungs, after taking Scientific Computation with one of his research mentors, Dr. Liz Bouzarth. As research partners for the summer, Mary Lib Saine and Zack worked with Dr. Liz Bouzarth and Dr. Kevin Hutson to create a computational model of a patch of pulmonary cilia to investigate the parameters of the cilia beat pattern that most strongly influence fluid transport. He was drawn to this research because it featured a blend of physics and mathematics in an applied project. 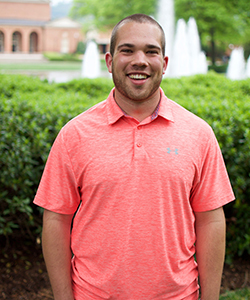 At Furman, Zack is involved with the TEDxFurmanU organizing team and is a teaching assistant for the introductory physics labs. After his graduation, Zack plans to attend graduate school to earn a master’s degree in aerospace engineering in order to further his goal of working as a rocket scientist one day. Being born and raised in Holland, Michigan, Taylor had always loved the environment of the local institution: Hope College. Taylor decided to enroll and became a part of the class of 2019. Taylor is pursuing a major and minor of electrical engineering and mathematics, respectively. Time permitting, he also desires a minor in computer science. In the summer of 2016, Taylor and his research partner learned how to undergo the processes of machine learning. Together, they worked on teaching computers how to analyze and identify bird calls using wavelet transformations, methods of denoising, as well as neural networks. Much of Taylor’s time was specifically spent on learning how to construct optimal neural networks, so the computer could identify a bird correctly as often as possible. After Taylor has graduated from Hope College, he currently plans to attend a graduate school in order to further his education in electrical engineering. I was born and raised in Holland, MI where I continued my education at Hope College. I am currently a sophomore, and I plan to major in engineering with a major or minor in math. I am also interested in minoring in Spanish. I really enjoy traveling, so sometime my junior year, I hope to study abroad. During the school year, I participate in intramural sports including basketball, flag football, and volleyball. I also hurdle and sprint for Hope’s varsity track and field team. Ever since I was little, math has always been one of my favorite subjects. I am so grateful that I had the opportunity this past summer to pursue my love of math by participating in an applied math research project! I absolutely loved working with my partner Taylor Rink and mentor Paul Pearson on our project, which encompassed the analysis of bird songs using wavelet transformations and neural networks! This research experience has showed me how vast the field of math is and its many uses and it has sparked my interest in applied math. I do not have set plans for after college, but I am thinking about attending graduate school for either engineering or math. Paul was born in El Paso, Texas but moved to Denver when he was seven. He graduated from Colorado School of Mines with a Bachelor's degree in Computational Applied Mathematics & Statistics in Spring of 2015. Part the coursework during his final semester as an undergrad included working with a small group of students under the guidance of Dr. Stephen Pankavich on modeling the spread of Ebola Virus Disease in Western Africa. They were able to construct a modified SEIR model and by utilizing data from the World Health Organization, their analysis allowed them to indicate which of the countries of Guinea, Liberia, and Sierra Leone was most in need of resource allocation at the time. This was his second undergraduate research project he was a part of, in the past, he worked with Greedy Sampling for high-dimensional scientific computing problems under adviser Dr. Mahadevan Ganesh. 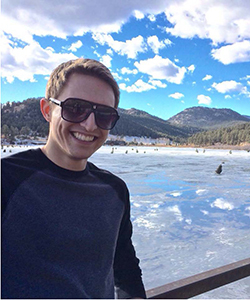 Paul has spent a semester abroad in the Budapest semesters in mathematics program during the Spring of 2014. Currently, he is working on his Master's degree in Computational and Applied Mathematics. The focus of his research is in the area of Active Subspaces and Sensitivity Analysis under his adviser Dr. Paul Constantine. He is hoping to finish this in one year and will be applying to Applied Mathematics Ph. D. programs during Fall 2015. 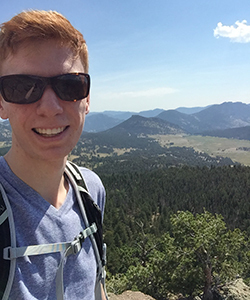 After growing up in Fort Collins, Colorado, Eric stayed in state to attend the Colorado School of Mines (and to climb more mountains), where he graduated in 2015 with degrees in Applied Mathematics and Engineering Physics. 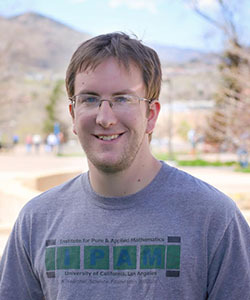 While enrolled at Mines he enjoyed a variety of research experiences, and especially cherished meeting new collaborators; during this time Eric dabbled in cryptography, mathematical HIV models, and quantum many-body physics. As a capstone to his undergraduate mathematics curriculum, Eric and a team of three others participated on a PIC Math project which strove to slow the spread of Ebola in Western Africa through placement of a treatment center. After modifying a SEIR model to suit the traits of Ebola, the team created a variety of metrics to quantify what an "optimal treatment center location" really meant in the mathematical model, and applied our analysis to the recent outbreak. This project demonstrated to Eric the importance of working on projects with a clear and directly applicable motivation that can help people, and he hopes to work on similar projects as he pursues a doctorate in Physics at the University of California, Santa Barbara, with a specialty in Biophysics. Gabbie grew up in Northeast Ohio and is currently a junior at Youngstown State University pursuing degrees in Applied Mathematics and Biology. 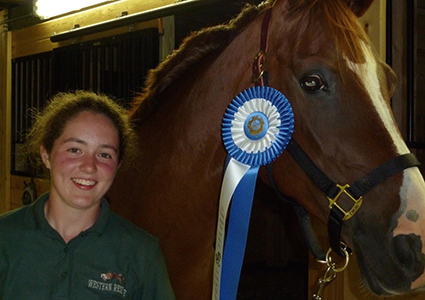 She enjoys participating in endurance sports, particularly long distance running and the equestrian sport of three-day eventing, which has made her very interested in sports conditioning and the amazing ways in which the bodies of humans and horses adapt and function. Math has also been Gabbie’s favorite subject in school for as long as she can remember. Being able to combine both math and biology under advisors Dr. Alicia Prieto Langarica of the Mathematics & Statistics department at YSU and Dr. Marnie Saunders of the Biomedical Engineering department at the University of Akron to model bone cell formation was the perfect opportunity for a first research project. Upon graduating from YSU, Gabbie hopes to go on to either graduate school in Mathematics or medical school. 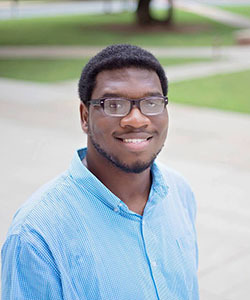 Alexander was raised in the Greenville, S.C. area, but made the move to Rock Hill for his undergraduate studies. He is currently a sophomore honors student at Winthrop University, pursuing a degree in mathematics. When his current mentor told him about a weekly differential equations seminar, Alex knew this could be a chance to develop his research interests. He found that he was very interested in the applications of mathematics to biology. During his first summer research experience, he worked in the field of mathematical cancer biology. He, with his partner, explored the dynamics of tumor growth and cancer treatment, with the incorporation of cancer stem cells. Although this was his first research opportunity, Alex has found great success. He has worked with his mentor, Dr. Kristen Abernathy, since the first semester of his freshman year; he plans to continue research in the field of applied mathematics in the coming years with her help. After earning his undergraduate degree, he hopes to attend graduate school for applied mathematics and education. This award was given for a paper presentation entitled "A Nonlinear Model of Cancer Tumor Treatment with Cancer Stem Cells"presented at MathFest 2014. Hannah was born and raised in West Richland, Washington. She has been interested in math since elementary school and she was a member of the school math team through middle school and high school. This year, she will be a junior at Whitman College in Walla Walla Washington where she is a Math major with a Japanese minor. Hannah will be studying abroad in Japan for her entire junior year. She plans to enroll in grad school in some applied math field and she is working on narrowing down her list of potential fields, one of her reasons for participation in the REU at Winthrop University this summer. Hannah had a great time working with her mentor Kristen Abernathy and her research partner Alex Middleton on modelling cancer and treatment. Dayna was born and raised in Rancho Cucamonga, California, and sheis currently a senior at Pepperdine University in Malibu pursuing a degree in Mathematics. Her mother is a math teacher and her grandfather was a civil engineer, and they both passed on to her a deep love for math. Dayna was given the opportunity by one of her math professors, Dr. Tim Lucas, to do applied math research with him over the summer under the umbrella of a biology research program. He had been working on the project for a couple summers already, so Dayna had some background knowledge and was excited about it. Dr. Stephen Davis, a Pepperdine biology professor, had been collecting data in a study site behind campus for 30 years and wanted to see what mathematicians could do with it. What they ended up with was a beautiful spatial model of chaparral growth in response to frequent wildfires and drought. It was Dayna's first research opportunity and she loved it! Dayna is graduating in the Spring, and she is hoping to find a job in the LA area, ideally using her math degree to do sports analytics. Kari is a senior at Unity College in Maine majoring in Wildlife Biology. 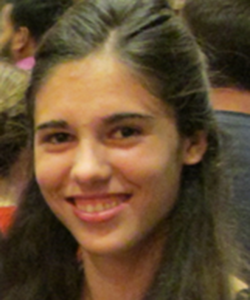 She grew up in Killingworth, CT on a small horse farm and has always had an interest in mathematics. When the opportunity arose to model zombies in an independent study during her junior year she jumped on it. The project involved running a modified game of tag on campus called humans vs. zombies and creating a model to fit to the data. The zombie virus bears several similarities to rabies and may be used to help with research in this other field. The project continued through the summer where Kari used matlab to research several different modifications of the SIR epidemic disease model by comparing them to data collected from the game. 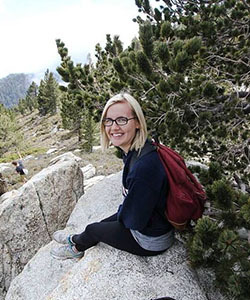 In the final year of her undergraduate career she plans to work as a project leader for a meta-analysis across multiple campuses running several games at once and hopes to create a more predictive model. 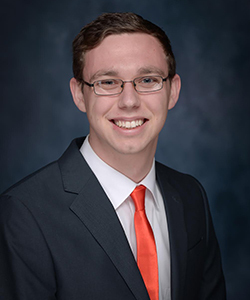 Jack is a Junior at the University of St. Thomas, working toward his undergraduate degree in Mechanical Engineering, as well as a minor in Mathematics. He grew up in Minnesota, where he enjoys snowmobiling, photography, skiing, and other outdoor sports. Jack has been involved in mathematical research since the end of his freshman year, working with Dr. Chehrzad Shakiban in the Applied Mathematics Department. His research focuses on the mathematical diagnosis of Melanoma from a variety of approaches, including the use of Invariant Histograms and Signature Curves. Some of his research has developed from the work of previous undergraduate students, while other approaches have stemmed from original ideas. In the future, Jack would like to be a strong contributor to the field of Engineering, and be part of something innovative. He believes that mathematics is a key foundation to the field of Engineering, and hopes to bridge the disciplines as much as possible throughout his education and time in the work force. This is Aaron’s third research experience. In 2010, Aaron did research with Dr. Cheri Shakiban on fractal geometry. This resulted in a poster presentation at the SACNAS National Conference that year. In 2011, he participated in an REU at the University of Wisconsin – Eau Claire where he studied invariant polynomials and representation theory with Dr. R. Michael Howe. 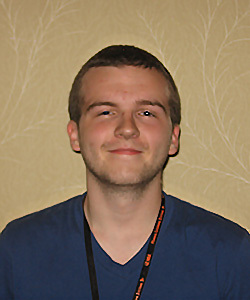 Aaron presented the results at the 2012 Joint Mathematics Meetings in Boston. In the summer of 2012, Aaron resumed work with Dr. Shakiban, this time working on the characterization of melanoma using a fractal dimension approach. This research was part of NSF’s Computational Science Training for Undergraduates in the Mathematical Sciences (CSUMS). 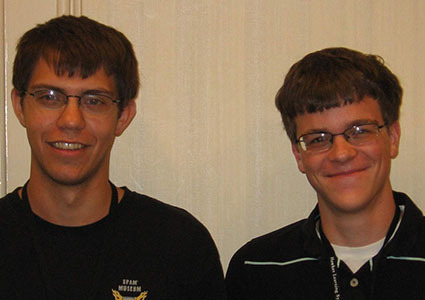 Aaron presented the results along with his colleague, Jack Stangl, at the 2012 MAA MathFest. The presentation was well-received. Aaron graduated in 2012 from the University of St. Thomas in St. Paul, Minnesota with a degree in Mathematics and will begin graduate studies in fall 2012 at Iowa State University. James was born and raised near Tyler, Texas, and continued his education at Tarleton State University in Stephenville, Texas. His original major was Engineering Physics, but after three years of classes James changed to Mathematics with a minor in Physics. While both mathematicians and engineers are problem solvers, James finds the problems of mathematicians more interesting. Upon changing majors he was eager to begin some kind of research, so his advisor Dr. Garza steered him towards a relevant current subject: the persistence of cholera in underdeveloped countries and refugee camps despite the existence of effective prevention methods. James worked on this project with fellow student Amber Dayhare. James has been working with Dr. Garza since August 2010, and will continue to do so for the remainder of his time at Tarleton. After graduating this December, he plan to attend graduate school for pure mathematics. 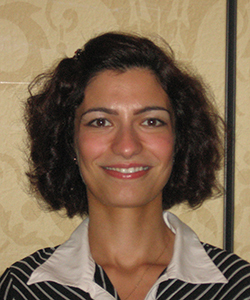 Sepideh is a senior graduating in December 2011 from Youngstown State University with a double major in mathematics and economics. She plans to attend graduate school to pursue a Ph.D. in mathematics. She was born in Iran and attended a high school with an intensive focus on mathematics and science courses. Instead of pursuing post-secondary education in Iran, Sepideh decided to move to the U.S., due to the greater educational and career opportunities available to women in this country. She originally was planning on attending medical school; however, as she took more math courses in college, Sepideh realized she gravitated more towards mathematics because of its logical structure. Although she loves pure mathematics, she is also fascinated by how mathematics can be applied to solve real world problems. This is exactly the reason she participated in NSF-funded biomathematics research at YSU over the past two years. During her first year of research, she investigated changes in the gene expression of E-coli when they are exposed to toxic materials (e.g., selenite). This year, her research dealt with a theoretical analysis of the time-to-peak response in biological systems. This workwas inspired by a recent paper by Theis et al. (2011), and has applications in the pharmaceutical field for designing drugs with extended release-time, chemotherapy treatments, and metabolism of toxic materials inside bacterial cells. For example, the model predicts the concentration of toxic selenite inside the cell and its metabolism to non-toxic elemental selenium over time. During the earliest stages of our research, my advisor Dr. Matthew Glomski and I looked to isolate an important and urgent problem in mathematical epidemiology. Working to make a small contribution in the modeling of cholera has proved to be an exciting, exasperating, and richly rewarding challenge. It is truly an honor to have our research recognized with this prestigious award, and this recognition certainly provides motivation for redoubling our efforts in future research. 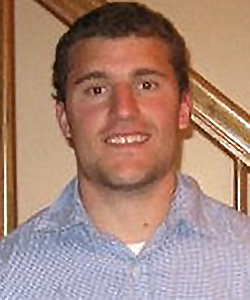 Joseph Lombardi is a resident of Long Valley, New Jersey and 2010 graduate of Marist College in Poughkeepsie, NY. 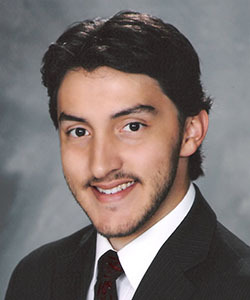 Joseph earned degrees in both mathematics and accounting, and is the recipient of the 2010 Marist College Award for Excellence in Mathematics. He began his research in mathematical biology during his junior year, studying the spread and mitigation of bacterial epidemics under the advisement of Dr. Matthew Glomski. Joseph's research has focused on cholera, a disease notable for its complex transmission cycle--one which has complicated mathematical efforts to model and ultimately control. Joseph hopes to continue his research in this area and submit his findings for publication in the near future. Currently employed at a New York City accounting firm, Joseph plans to apply to graduate programs in applied mathematics in the near future. 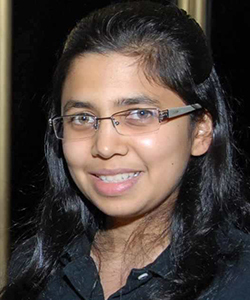 Manasi Vartak graduated from WPI in May 2010 with a double major in Computer Science and mathematics.The areas of computer science that interest Manasi the most are databases, algorithms, scientific computing, and software engineering. However, she loves learning new things - especially challenging things - so this listwill probably keep growing. She is paricularly interested in the interdisciplinary applications of computer science such as compuational biology and genomics. 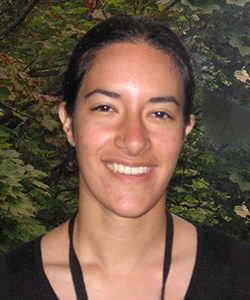 After attending a lecture of Professor Marian Walhout from UMass in December 2010, Manasi had the idea to write a senior thesis in mathematics based on Prof. Walhout's work on analysis of regulatory networks. Manasi presented the results of this research at Mathfest 2010. Manasi is currently working in Seattle but plans to attend graduate school later. Joseph says the following about his project: Robert's and Derek's project, "Analysis of Type I Diabetes with Wavelets", as the title indicates, applied wavelets and other mathematical tools to blood glucose time series to deepen understanding of this serious disease. I am from Long Island, NY and am a Junior at Stony Brook University, also on Long Island. Mathematics has always interested me, with most of my undergraduate education focusing on pure mathematics. This love for math led me to attend the Grand Valley State University Research Experience for Undergraduate Program, which provided me with my first opportunity to do research. It is here that I was introduced to applied mathematics and worked with wavelets and diabetes. The project was very interesting and exposed me to the world of applied mathematics. I plan on going to graduate school, though I am not sure whether in pure or applied mathematics. I'm from Rose Creek, Minnesota and attend college at Drake University in Des Moines, IA. I started as a history major and didn't become seriously interested in mathematics until taking calculus in college. The subtleties of math (linear algebra in particular) soon won me over, and I am now a mathematics and computer science double major. What I found especially intriguing about our project were the numerous mathematical tools that we could use to analyze diabetes data-wavelets, clustering algorithms, statistics, etc. I'll be graduating this fall and plan on attending graduate school in mathematics after that. Robert's and Derek's research mentor for this project was Prof. Edward Aboufadel through the REU at Grand Valley State University. Yasmeen is an honors mathematics major and music minor. Her project, "Coagulation: the Fifth Factor" studies blood clotting using differential equations. In direct comparison to results of biological research on clotting factor V, Yasmeen found that the controversial results from clinical trials are not supported by the mathematical model of coagulation. I was born in Chicago, raised in Connecticut, and moved to Utah during high school. I became interested in pure mathematics during high school, but quickly switched to applied mathematics in my first year of college at the University of Utah. I have been working with Prof.Fogelson since spring semester of freshman year, and plan to continue working on math biology problems with him. I will be graduating from the U of U this May with an honors math major, a music minor, and a service-learning designation. Post-graduation plans are up in the air right now- there are so many possibilities! Heather's research mentor for this project was Prof. Aaron Fogelson at the University of Utah. I'm originally from El Paso, TX but I grew up in Cambridge, MN. And that's where I got into mathematics. I was put in the advanced classes during high school and I really liked it. Originally, I planned on going into engineering when I got into college (silly me) but soon discovered that plain ol' math was way better and that's where I'm at now. Once I graduate, I'm not entirely what I'll be doing. I'll either be going to grad school, becoming an actuary, or working with secret things at the NSA (which would be awesome). Heather is a mathematics major and computer science minor. Her project was "Statistics on RNA Secondary Structures". She examined several different types of RNA to determine if Willenbring's B statistic was a good discriminator. Based on her samples, it appears that certain classes of RNA have typical values of B.
I am from McGaheysville, Virginia. I first became interested in mathematics as a high school sophomore while taking AB calculus. I decided to major in math after attending the Virginia Governor's School for Science and Mathematics after the summer of my sophomore year in high school. The thing I found most appealing about mathematics was the many varied opportunities for study. I liked that at JMU, I could tailor my undergraduate career to either pure mathematics, applied mathematics, or statistics. I decided to focus my undergraduate studies in the direction of applied mathematics after beginning a project with Dr. Anthony Tongen and completing JMU's Computer and Numerical Algorithms course. My research interests include mathematical biology and numerical ordinary differential equations. I am currently working on narrowing my list of potential graduate schools as I will soon begin applying to applied mathematics PhD programs. Deena's project was "An Optimal Energy Allocation Strategy for Multiple Constrained Resources". She used difference equations to model a population with overlapping generations and competing subpopulations. The goal was to determine how such a population could best allocate its energy to obtain both food and shelter when those resources are limited. Deena's research mentors for this project were Prof. Anthony Tongen and Prof. Brian Walton at James Madison University. 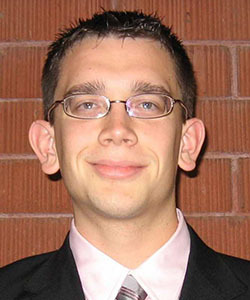 The first Janet L. Andersen prize for excellence in mathematical and computational biology was awarded at Mathfest 2007 to Andrew Matteson of Texas A&M University for his work on "An Enzyme Kinetic Model of Tumor Dormancy". Andrew is a native Texan from Amarillo. He reports that he first became interested in abstract mathematics in third grade when he was fortunate to have a mentor who de-emphasized "practical knowledge" in favor of questions without answers (the most valuable type) and fostered a belief that everything should be possible and knowable. I believe there is something beautiful about pattern formation from a disordered state. It is this idea that touches each of my projects and gives me real pleasure in this work. Outside of mathematics, Andrew is active in anusara style yoga and lindy hop swing dancing, and loves spending time outdoors . He has recently taken on the project of reading the thirteen volumes of Will Durant's Story of Civilization and reports that he has "about 6000 years to go". 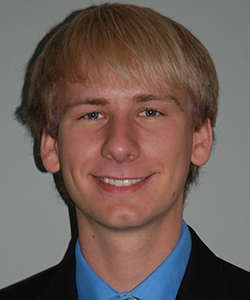 Andrew will graduate from Texas A&M in 2008 and plans graduate study in mathematical biology.